In the middle of the 9th century, an author calling himself Isidore composed and published a series of forged papal decrees. His forgeries remained undiscovered for centuries, because he was clever enough to incorporate them into a collection of genuine decrees. This manuscript contains a copy of that partly-genuine and partly-forged collection; it was probably started in France (or by a French scribe working in England), but the text was finished and the decoration was added at Christ Church, Canterbury. 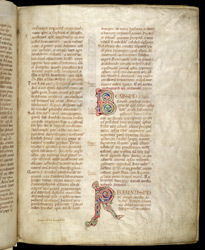 The initials on this page, one of which is partly formed of a dragon, introduce a copy of a 4th-century letter from a bishop of Carthage to Pope Damasus, and his reply. In both rubrics, and elsewhere, the word 'pope' has been erased: a common form of censorship during the Reformation.